A super simple and fantastically delicious side dish for any night of the week. Throw a few simple ingredients in your slow cooker and have these Cheddar Bacon Ranch Potatoes ready in no time! Side dishes are mostly an after thought, am I right? Often times I’ll have a plan for dinner such as chicken or steak, and then when it comes time to serve, I’m scrambling around to throw together some vegetables or salad. I decided it was time to be a bit more prepared! Baked potatoes are a great side dish, but require us to be present in our kitchen for at least an hour. So why not throw together your favorite potato ingredients into a slow cooker and see what happens? The good news is, I already did that for you! My goodness was it delicious. 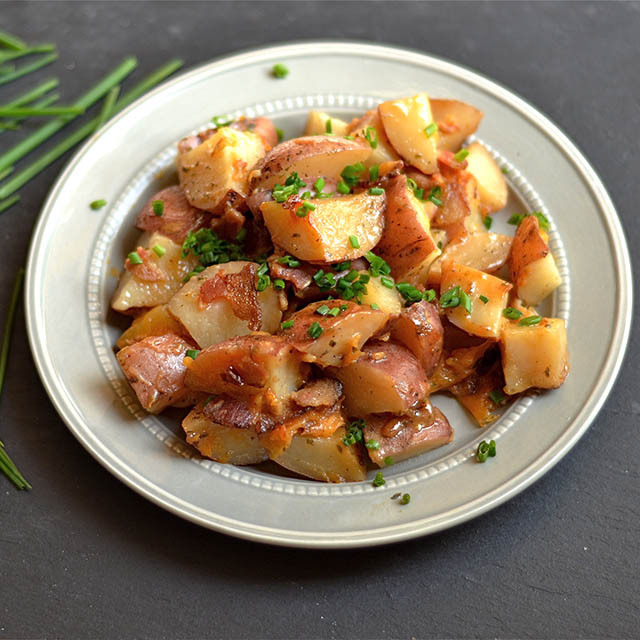 Very reminiscent of super yummy potato dishes we used to eat in Germany, and who knew it could be this easy. I cooked 6 slices of bacon beforehand (skillet, oven, or even microwave is fine). I mixed together a packet of ranch seasoning (Hidden Valley makes a great one) with a little olive oil to form a paste. Once my potatoes were cut, I threw them in a ziploc bag and tossed them around with the ranch “paste”. Place the potatoes on a large piece of foil. 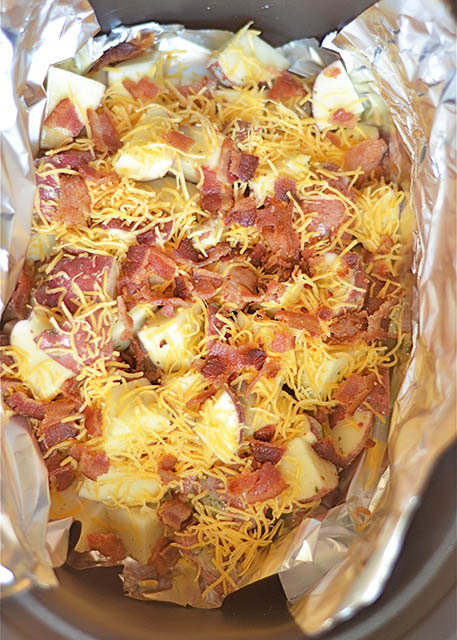 Top with crumbled bacon and cheese and wrap the potatoes in a foil pouch. Place inside the slow cooker and cook on high for 3-4 hours. 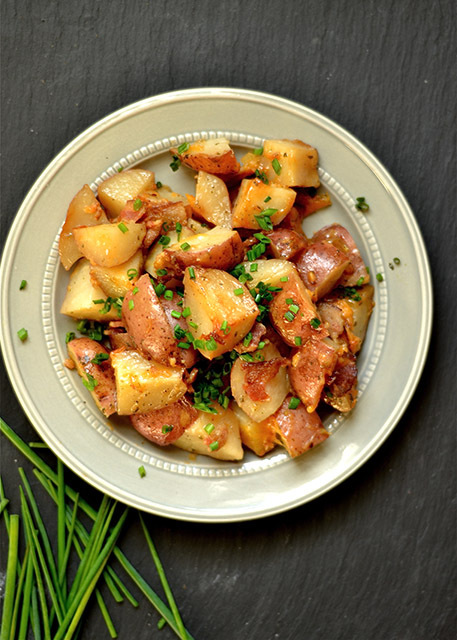 These potatoes would be fabulous with a dollop of sour cream, or chopped chives. They are so full of flavor and bound to be a HUGE hit! Even my 6 year old who claims he does not like potatoes, asked for seconds. We’ll be making these often! Enjoy! Begin by cooking your bacon. Use a stovetop skillet, microwave, or oven to cook bacon to your liking. Set aside to cool, and crumble. Chop your potatoes into small chunks. Set inside a large ziploc bag. Mix together ranch seasoning, oil, and water in a small bowl to form a paste. Pour inside ziploc bag, and toss to coat the potatoes. Place the potatoes on a large sheet of foil. Top with crumbled bacon and cheddar cheese. Wrap the foil around the potatoes to create a large pouch. Place inside the slow cooker, and cook on high for 3-4 hours. Remove and serve hot. Top with extra cheddar, chives, or sour cream.